I love knitting the basketweave stitch. Remember when I said that a lot of times knitting looks complicated? Well this stitch pattern looks complicated. The great thing is, it's pretty easy to do. It might still be a little challenging for beginner knitters but it will be great knitting practice. It's a simple combination of knits and purls and creates pretty textured stitches. You can use it for anything you want. I've seen really nice sweaters, hats, afghans, pillows and scarves. 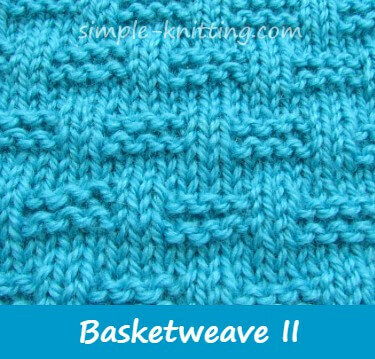 And like so many stitch patterns the basketweave stitch has lots of pattern variations. The first stitch pattern is the one I grew up with and it is my favorite. The others are variations from it that you can try as well. They are all simple to do so have fun with them. This one is so fun to watch as the pattern slowly starts to come alive. I have heard that this stitch pattern is also called checkerboard. I like that and as a checkerboard this stitch pattern does stand out. I think it also looks like basket weaving too. And wait until you see it on a big knitted swatch. If you'd like to knit a sample cast on 21, 29 or 37 sts. Row 3: Purl 5, *Knit 3, purl 5; repeat from * to the end row. Row 6 and 8: Knit 1, Purl 3, *Knit 5, purl 3; repeat from * to the last stitch Knit 1. Row 7: Purl 1, Knit 3, * Purl 5, Knit 3; repeat from * to the last stitch Knit 1. 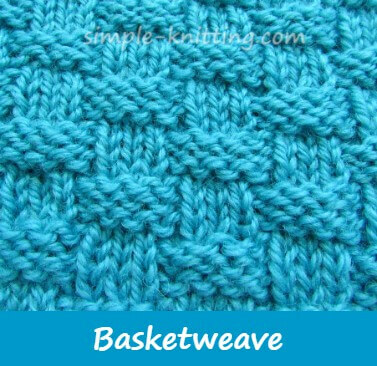 This basketweave stitch pattern is also called the basket stitch. While it doesn't stand out quite like the first basketweave stitch pattern it is still very pretty. When you use a yarn with good stitch definition like wool or cotton you'll notice the columns of Stockinette stitch kind of pop up a bit. This type of pattern will be nice for adding a little texture to a sweater or afghan. This is a really pretty basketweave stitch. It has a bit of seed stitch mixed in. I can visualize a lot of pretty things with this stitch pattern, it's just lovely. I am thinking of using it for a blanket or a small lap blanket or even a sweater or hat would be nice too. If you'd like to knit a sample cast on 19, 27 or 35 sts. Rows 2 & 8: Purl all sts. These last 12 rows form pattern. 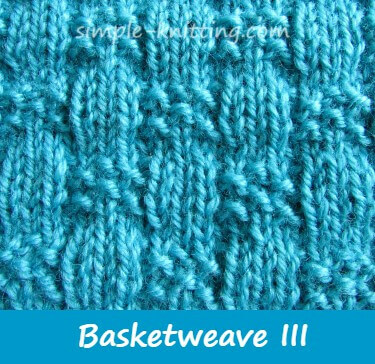 Would you like a basketweave knitting pattern? Great! I found a lovely scarf knitting pattern that uses the top basketweave pattern on my page and it's a free download from Ravelry by Knitted Moon Designs. It looks like a fun and easy pattern. Hope you like it.